Doncaster RLFC failed to become the first side to win at Odsal this season as Betfred League One leaders Bradford Bulls charged to a ninth successive victory. Bulls topped the half-century mark for the fifth successive game as they handed the Dons a 56-14 defeat. But they were made to work harder than they probably expected for the first hour or so taking into account Doncaster’s recent results and their growing injury problems as Richard Horne’s men produced arguably their best away performance of the season before running out of steam in the final quarter. Certainly there was no lack of effort, or skill, from the Dons whose cause wasn’t helped by losing dual-registered prop Lewis Beinek in the first half – something which had an adverse effect on their second half rotation on a very hot day. Hoping to avoid a third successive away defeat, the Dons got off to the worst possible start, winger Ethan Ryan touching down in the corner for an unconverted try after just two minutes. But the South Yorkshire side, beaten 72-6 in both of their last two visits to the stadium, hit back in spirted fashion with half-back Jordie Hedges, who failed to add the extras, going over from close range on seven minutes to level the scores. The Dons continued to hold their own until falling behind again on 18 minutes when Ryan outjumped his opposite number Sam Doherty to touch down from a kick to the corner by Dane Chisholm. No sooner had the cheers died down than prop Steve Crossley forced his way over from close range. Half-back Dane Chisholm again added the extras to give Bulls a flattering 16-4 lead at the start of the second quarter. The Dons gave the score-line a more representative look on 24 minutes when leading try-scorer Jason Tali, who had an impressive game, rounded off some slick handling when running strongly to score. Hedges again failed to convert a kickable goal. Beinek, who picked up an injury and wad substituted minutes later, produced a tremendous run down the right from his own 20 to create the position from which the Dons twice went close to a third try following more enterprising play. Bulls opened up a 22-8 lead when full-back Brandon Pickersgill scored a fine individual converted try on the hooter. It was the Bulls who struck first, Chisholm jinking his way over for a 51st minute try which he also converted to make it 28-8 to leave the Dons with a mountain to climb. Centre Cameron Scott showed the Bradford cover a clean pair of heels when racing in from 50 metres out for 64th minute try converted by Hedges which cut the deficit to 14 points. 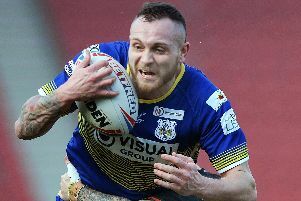 Any comeback hopes the Dons may have entertained were effectively dashed when loose-forward James Laithwaite and Pickersgill went over in quick succession to make it 40-14. Ryan (2) and Callum Bustin added further tries as Bulls finished well on top in the closing stages. Dons: Owen, Doherty, Scott, Tali, Sanderson, Hedges, Miller; Spiers, Kesik, Boyle, Lane, England, Martin. Subs: Beinek, Litten, Muranka, Scott.